This package includes 3 Ice and Heat Bags- One large (11"), one medium (9"), one Small (6"). Whether you are experiencing a headache, muscle soreness or sports injury, get the soothing relief from hot or cold therapy right away with these bags. They are ideal for injuries or sprains and will help reduce the swelling. Very simple to use. 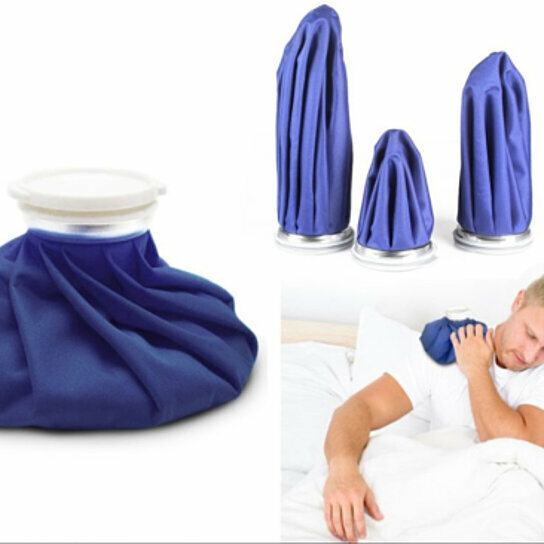 Just choose the suitable size according to your needs, remove cap then fill with ice cubes and crushed ice or cold water(in case the sharp edges on ice cubes may stick to the body or cause damage to the inner lining), release excess air from bag, then you can get grab-and-go comfort from pain. Note: This should not be used on people whom have known medical conditions.